That's great! I used to also use the stroller threat and it does work because no way do they want to be in there! I can't even imagine how hard keeping track of two at a time would be. I can see how it's even more important for you to be consistent 100% of the time so they know exactly what will happen if they don't listen. I've found that consistency is key with these two (as it is with most kids, I'm sure). They play me for fools otherwise! Brilliant! So going to use this with next one. In 3 years we have used a leash (it was more like an extension to little guy's belt and the other end attached to our wrist) one time and that was while arriving and departing the Magic Kingdom in Disney World on the most crowded day of the year. 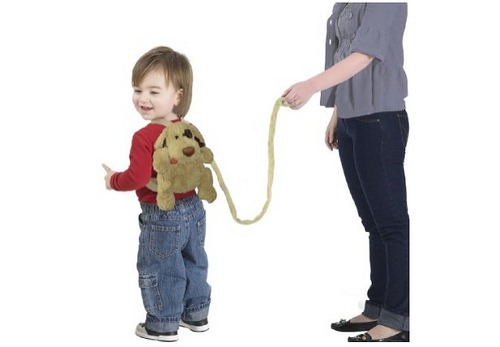 I bought a leash for Monkey (dinosaur backpack, so cute! ), primarily for him to wear in hospital so that we could reduce the risk of him running off faster than expected and pulling his IV lines out. Right after it arrived (I ordered it online because all the cool stuff comes from the interwebs), his treatments ended - so we've never used it!